With the open beta starting soon, several members of the team responsible for the updated Summoner's Rift gathered on the forums to host a Q&A on upcoming map changes! The following Rioters made an appearance in today's Q&A. Without further ado, here's Riot Aeon with an introduction to kick things off! "Hey All! We've got members of the team working on the update to Summoner's Rift here to answer your questions. Ask away!" As usual, I've clumped the Q&A answers together based on topics! Enjoy! "We've been working on updating Summoner's Rift for the last few years. We've gone through a lot of iterations, some of which didn't make it out to players and there have been a few iterations that have made it out to all y'all. 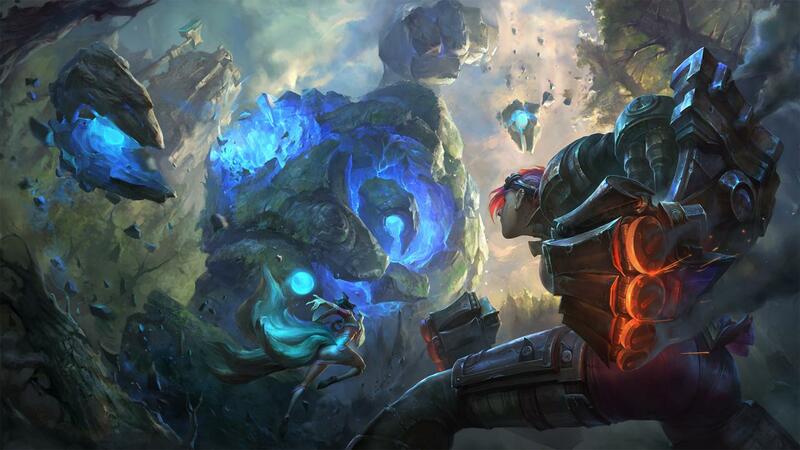 The updated Summoner's Rift in its current fashion has been in full production for a little over a year." "We have many reasons to update Summoner's Rift and the main reason is, like everything we do for LoL, to improve our players' overall experience by continuous evolution. Our main focuses are increasing gameplay clarity and readability, visual fidelity, and thematic cohesion." When particles hit is more clear: Should help with last hitting and knowing when you're gonna get hit. These guys have an important place on the map, and a visual update alone wasn't enough to make them feel as epic and important as they are. So we made some gameplay changes to support more epic in-game encounters and go along with their new look. We're honestly still looking at both of these creatures closely and changes could still happen to make sure they're working well for visuals and gameplay." Riot Nekomaru also chimed in on camera angle changes on the new Rift. "We actually did a bit of trickery with the camera on the updated Summoner's Rift to make skill-shots appear more accurate and help players on red side. The camera has been zoomed out while decreasing the field-of-view on the back-end, which has the result of showing the same amount of playable space while reducing the fish-eye effect around the edges of the screen. This reduces the curvature of visual effects (Nidalee spears!) that are near the edges so that you don't run into the situation where you get hit by something that looks like it missed as often. The camera angle has also been raised slightly, as the current camera angle shows more above your champion than below them when playing with a locked camera. The new camera angle evens it out so that you see about the same above and below, which should help players on red side while in lane. As for the pathing, one of our major art goals was to make sure that the visuals of the environment match what you can and cannot walk through as accurately as possible. All of the trees, rocks, and other things blocking your movement have been created with that in mind." "That is a super tough question. There are so many things we wanted to preserve and build upon from the old map. Ultimately, next to game-play, the biggest lesson from the original map was how well it balanced a sense of danger with light-heated fun and whimsy. Personally, I really wanted to make sure we kept some of the odd little things you found when really looking around the map. For instance, we added something special in the North base shop as a nod to the old days..."
"We agree and this was a difficult challenge to tackle given the balance the map needed to maintain. We decided to build fountains into the islands near the center of mid lane to act as a source. With a bit of imaginative thinking we see the river as "flowing" towards the edges of the map and exiting out a cave you can see outside of bot lane. We imagine there is a similar cave in the North. To keep it simple and clear we imagine the water to have descended into an underground aqueduct. It was a tough call but we wanted to prioritize game-play over art." "While we were working on the updated map, we noticed that the brush in top and bottom lane was actually slightly closer to the red side turrets than the blue side ones. That's been addressed in the update, but bush placement in general is the same as the current map." "Aside from some minor improvements to layout, brush is identical to live." "We chose this shade of red because we felt like it looked good visually with the rest of the mage thematic elements... And we did actually try a more pink-ish red during development, but we ultimately felt like it made the red side of the map not feel like SR, so we changed it to a more saturated, bold red." Oh, here's a good one. Considering everyone calls the respawn point "the fountain" did you try at some point to incorporate actual fountain designs into it? If so, why were these plans changed/dropped? If not, why not? Great question. We considered many angles while designing the bases. The big challenge with designing around the name used in NA is that we have many regions to consider. For instance, in China the inhibitors are called "crystals." Therefore we decided to focus on creating thematically cohesive structures. That way we create something that really feels like a place in Runeterra. That said, the north base kinda looks like a fountain. ;)"
"We're not going to have anything in for launch, but it's something we're considering doing in the future." "Part of it was clarity (making sure there is no confusion about what a turret is and does) and part of it was art (cohesive shapes and structures for each team)"
"VO for the shopkeepers is still something we hope to have in the future." "They will not be in for launch but it's something we're exploring for a possible future patch." "It basically comes down to clarity. For a player who doesn't know what the wolves do, having two different camps, say wolves and dingoes, would raise the question as to whether these monsters have different combat or provide different rewards. Having wolves on each side makes it easy for newer players to recognize that these camps serve the same purpose." 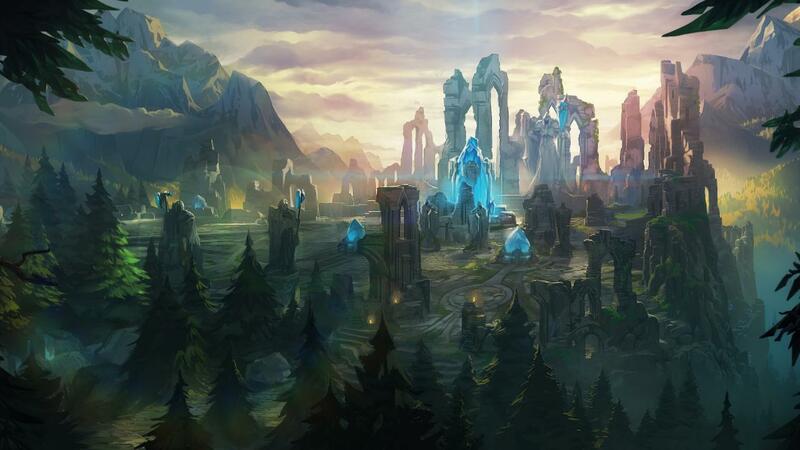 "We started with the idea of Summoner's Rift as a magical forest habitat. From there, the goal was to create jungle creatures that fit in and live in that environment while still fitting into the League of Legends world and remaining familiar to people who have been playing on the current Summoner's Rift for years." "On the art team, we take inspiration from every possible place you can imagine. We spend a lot of time looking at art, cool animal picture reference, monsters from other video games, movies, etc. For the SRU creatures, we didn't take inspiration from any one place, but we had a set goal in mind. We wanted to create iconic creatures that felt uniquely "League" and felt appropriate to their environment, and so we looked at a broad range of inspiration and boiled it down to the elements we felt most clearly conveyed that." "The spawn animation will happen every time the creature actually spawns into the rift. To clarify, if the Dragon has been alive for a couple of minutes and you walk over to him, you won't see the spawn animation play. However, if you are near the pit (or you have vision because you were a great teammate and placed a ward there) as the Dragon spawns in, you will see the animation play out. This is the case for every time the creatures spawn in." Early on in development, we heard that this new map would be friendlier to older or weaker machines. Has this ideal been maintained and, if not, what will be the impact on our machines? We've done a lot of testing on this, and most low spec computers should run faster on the update to Summoner's Rift. Every computer is different, so, while this can't actually be guaranteed, we feel comfortable saying most people will have better frame rate performance now." "Will SR's graphics be more demanding? In some ways yes, and in other ways no. You should see similar or better framerates to the current SR. We are going to be releasing a devblog in the near future that gives more information about this topic :)." "Yup! Lots of new visual & texture updates for champs have happened and will keep happening to make sure everything plays nice together :)"
"While we have definitely taken this into consideration when building the update to Summoner's Rift, I can't provide an answer to any specific holiday or other skins that are upcoming." "We're not doing a Winter version this year, but it's something we hope we can do in the future." When asked what their personal favorite parts of the new map are, several Rioters chimed in! "I like the Gromp. He's adorable in that weird giant gross predatory magic toad sort of way." "I love the East jungle. It's got this great eerie and magical feeling on which the artists really knocked it out of the park. I also love the Dragon encounter, especially when he spawns in. He really looks menacing." "I personally love the red side fountain turret! Floating laser crystals!" "While I'm totally blown away by the work the artists on the team have accomplished from a pure fidelity standpoint, my favorite improvement to the map is to clarity --- specifically around the contrast of the playable and non-playable gameplay space --- it's so much easier to see champions and their skill shots and other abilities --- they really pop-off the background now. Additionally, it's much easier to see walls and parts of the jungle so you can more easily read how your champ will path around the map." "Really really love some of the small animations in the environment. Things like wind over the grass and trees go a long way to making the place feel like a living place to me :)"
"What's my favorite part of the map? but favorite "area" of the map? North East Jungle, the more blue-forest side. I think it has a really cool mood to it." "The top lane vista. Makes me want to go adventuring." Ultimately R.I.P vultures and we went back to the drawing board!" "At one point we had some wispy effects in the east side jungle that looked cool and heightened the mood. When we ran some playtests with them the junglers kept thinking someone was coming after them when they saw movement out of the corner of their eyes. Those were toned down shortly after that."